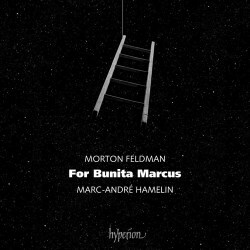 The last decade or so has seen several new recordings of For Bunita Marcus. Performances range in timings, given the predilection of the individual pianist and their absorption of a Feldmanesque sense of time. That excellent instrumentalist Ivan Ilić, whose recording of Reicha I’m currently listening to, rather harries through the set in 66 minutes. Hamelin, alongside performers such as Hildegard Kleeb, takes far greater latitude, his horizontality stretching to 72 minutes, though this is nowhere near Sabine Liebner’s Oehms traversal which takes 88. The music’s weaving of small, repeating motifs coupled with an unstinting approach to dynamics generates a compelling narrative unfettered by the constraints of development or time. It’s music that utilises the decay of sound as integral to its meaning. The limpidity and the refractive nature of the piece requires a balancing of a just sense of momentum with careful attention to the many and various detailed markings in the score: too slow a performance and a sense of fracture enters the architecture, too swift and those cellular motifs become compacted and the music tends to sound terse. Hamelin’s technical mastery and control of gradations of tone and volume are put to the test here and he proves masterful. Intimations of sound decay can be sensed early (track 4) whilst shifts in dynamic gradients occur soon after (try track 7 and the very end of 17). The abstracted stasis embedded in the music can best be heard in track 9, and for Hamelin’s control of the music’s cardiology, take a listen to track 18. Back in the 1920s Heifetz once said that recorded music should be listened to in the dark. This piece is certainly a candidate for cloistered, shuttered and in-the-dark listening. Hamelin’s richly, ripely recorded performance manages still to detonate when required, which puts his performance (and recording) at a remove from those of Steffen Schleiermacher on MDG – rather backwardly placed – or the crisper attenuation of Liebner. Hamelin’s is certainly not the only way to approach this monumental exercise in self-absorption – to listen to it is also a quasi-monastic exercise – and others have lived far longer with the music than he has. But his performance is both absorbed and absorbing, he takes central, thoughtful tempi, his dynamic shaping is convincing, and his attention to detail is colossal.